Here, you will be walked through playing the inversions for the C major chord on the bass guitar. You can use these same patterns for any major chord inversion. In these examples, the octave is added to the C major triad, so you play four notes — root, 3, 5, and octave (C-E-G-C) — rather than three. Here, you see the major chord with C as the root, called the root position. In this chord, C is also in the bass. Here, the term bass refers to the note that sounds the lowest in any chord. 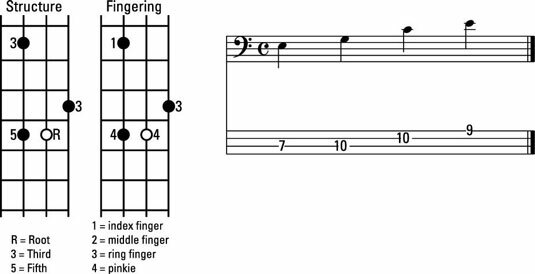 Start with the C on the 8th fret of the E string, using your middle finger, and play the C major chord. 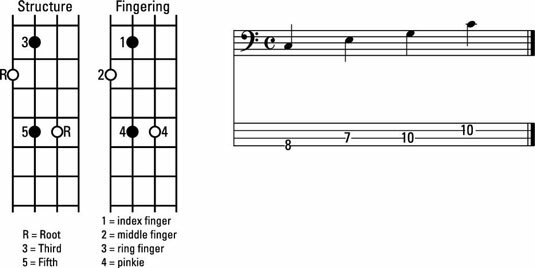 To play the 1st inversion chord, find the 3rd of the C major chord (it’s the E on the 7th fret of the A string). Play the C major chord starting with the 3rd in the bass. The chord is now E-G-C-E, with E being in the bass. C is still the root. 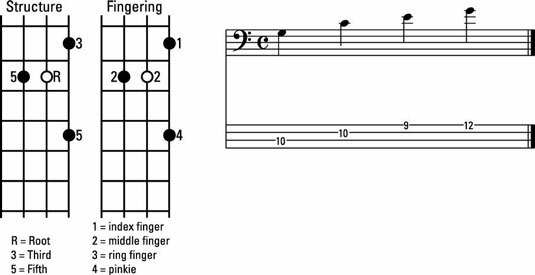 Keep your hand in position by starting the inversion with your index finger on the E.
For the 2nd inversion, find the 5th of C, which is G. You find the G on the 10th fret of the A string. G is now your starting note, but C is still the root of the chord you’re playing. Follow the grid, and keep your hand in position, starting with your middle finger. The chord is now G-C-E-G.